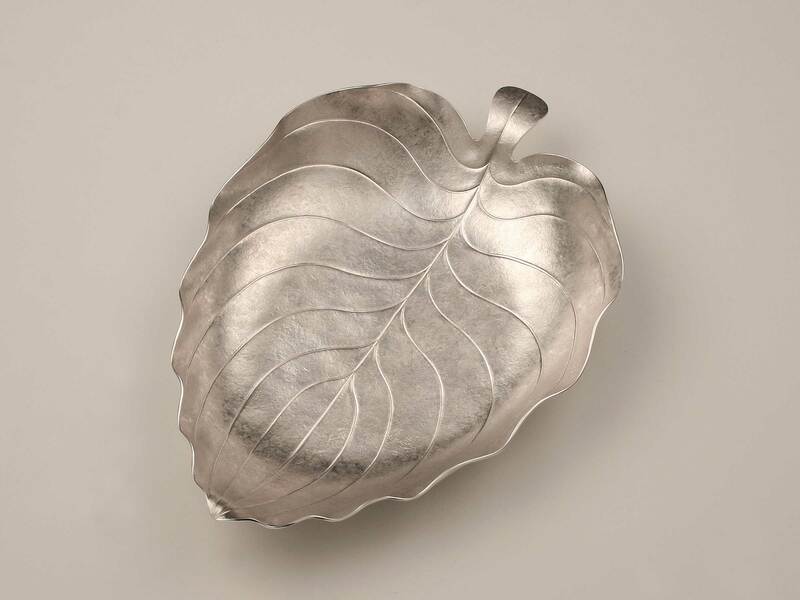 A naturalistically shaped hosta leaf bowl with wavy rim, clear midrib and fan-shaped venation. An exceptional, large and impressive bowl of a good gauge from one of nowadays leading english artist silversmiths. This outstanding bowl is a commission work exclusively made for our gallery. Several exhibits by Miriam Hanid form part of public and private collections as examples of outstanding modern silver craftmanship already today. For example the Victoria & Albert Museum, London commissioned her with the Union Centrepiece which forms permanently part of the collection. Her work is recognised with numerous awards and participations in exhibitions and she furthermore can refer to commissioned works for the royal house. Central characteristics of her works are always an exceptional design paired with a virtuoso technical realisation producing objects for the daily use with a sculptural nature. Any decoration does not form part of the offer and is shown for illustrational purposes only.